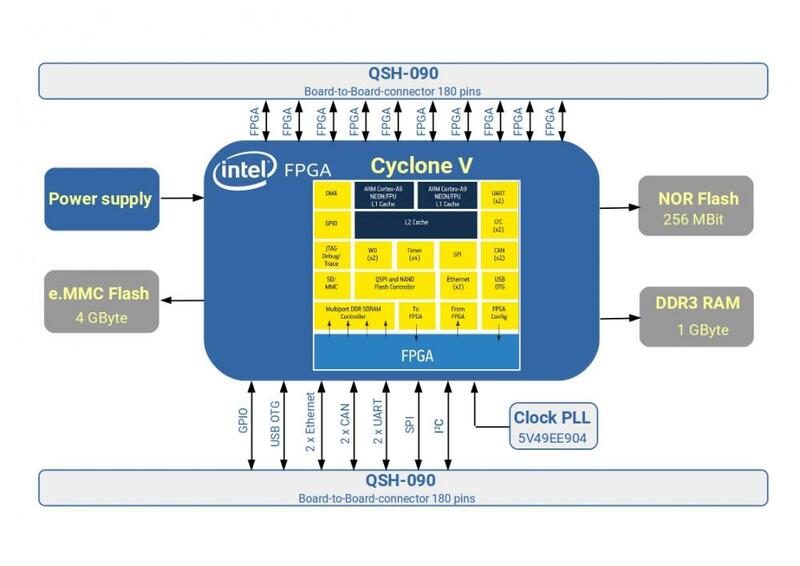 MCV offers the full flexibility of the Altera Cyclone V SoC FPGA family. It integrates an ARM-based hard processor system (HPS) consisting of processor, peripherals, and memory interfaces with the FPGA fabric using a high-bandwidth interconnect backbone. The Altera SoCs combine the performance and power savings of hard intellectual property (IP) with the flexibility of programmable logic. MCV features additional hard logic such as PCI Express® Gen1, multiport memory controllers, and high-speed serial transceivers. Our SoCs drive down power and cost while enabling performance levels required by cost-sensitive applications. Due to the flexibility of the MCV concept 25KLE, 40KLE, 85KLE and 110KLE SoC FPGAs are supported by MCV. Maximum flexibility for using the SoM with 'exotic' interface requirements. Combining standard IP cores like i.e. display-controller, Ethernet, CAN, serial, I²C, SPI, etc, unique SoM configurations can be used. Benefit from the variety of freely available IP-cores by Altera, or, create your own. The SoM supports mainline software for U-Boot and Linux. The BSP covers the entire HPS part of the SoC FPGA. A supplies software development services for drivers, bootloaders and their integration for MCV.